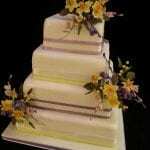 The selection of wedding cakes shown here range from very simple stacked cakes to more elaborate designs. 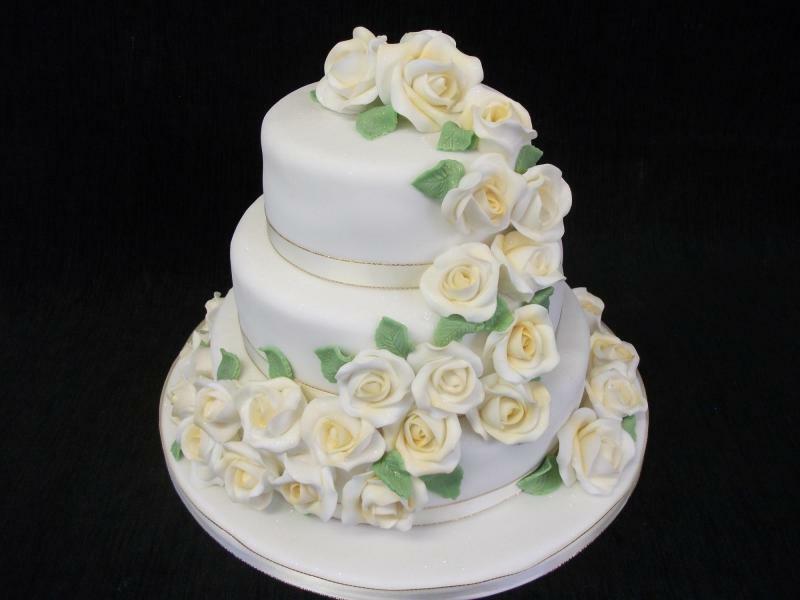 We have shown examples of customers’ cakes varying from hand-made sugar flowers to fresh flowers which complimented the bridal bouquet. Any of these designs can be replicated or adapted to suit your own wedding theme and colour or we can create a completely original design to match your needs. 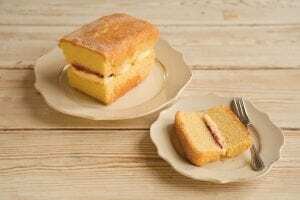 All our cakes can be made from Finest Moist Fruit Cake, Light Sponge with jam and cream filling, Rich Chocolate Cake, Lemon Cake, Carrot Cake or a combination of all of them! 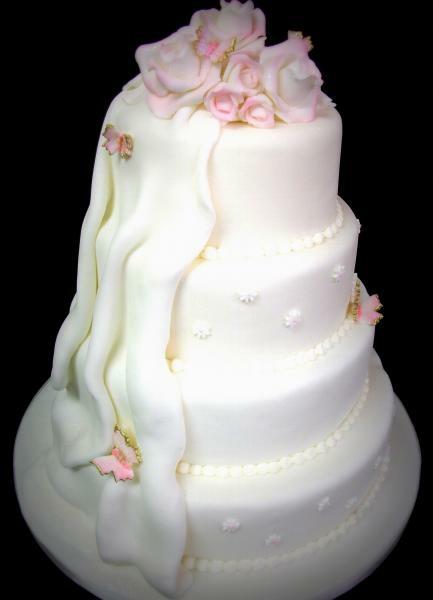 Three or four tier stacked wedding cake, with sugar paste draping, flowers and butterflies. 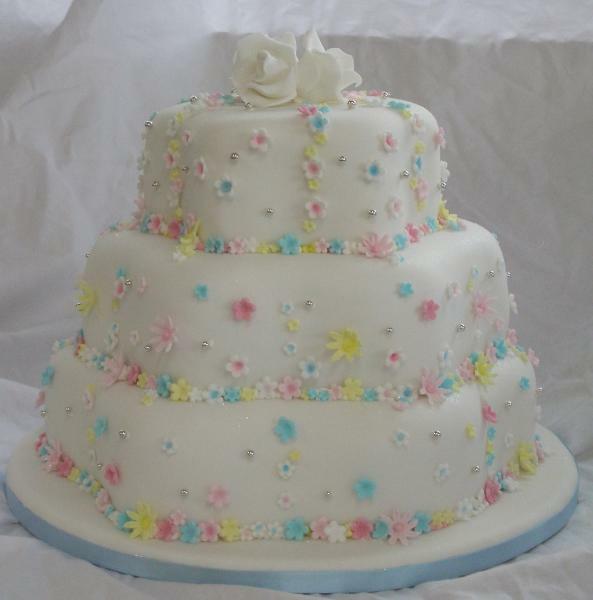 This style can be adapted to any wedding colour or theme, and can be made sponge, fruit or combination of the two. 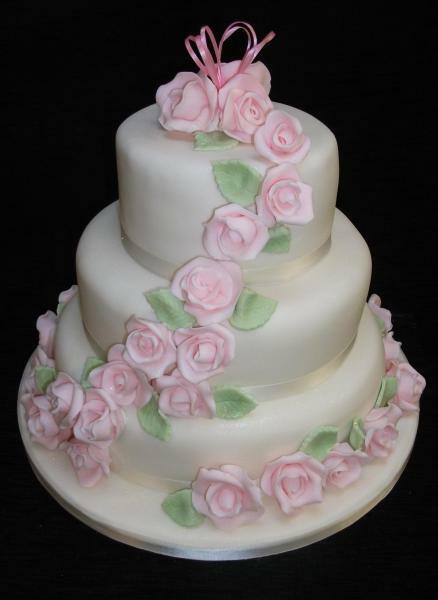 A three tier cake is elegantly stacked and adorned with hand-made sugar paste roses for a beautiful effect. 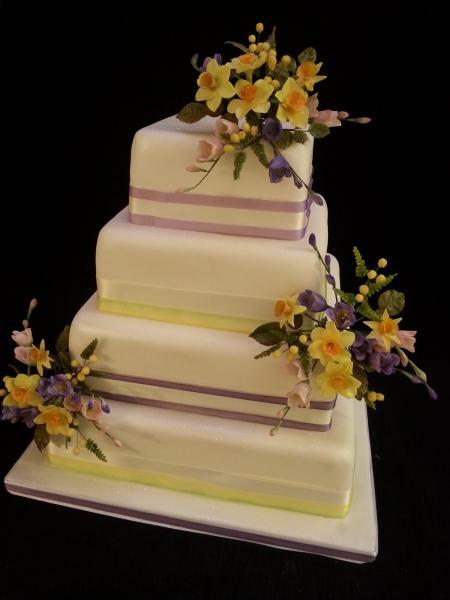 The colour scheme and flower can be changed to tie in with your overall colour scheme or bridal bouquet. 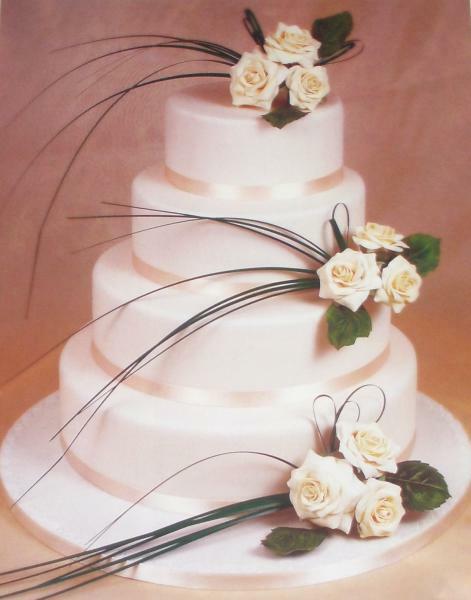 An elegant three tiered stacked wedding cake with clean lines. 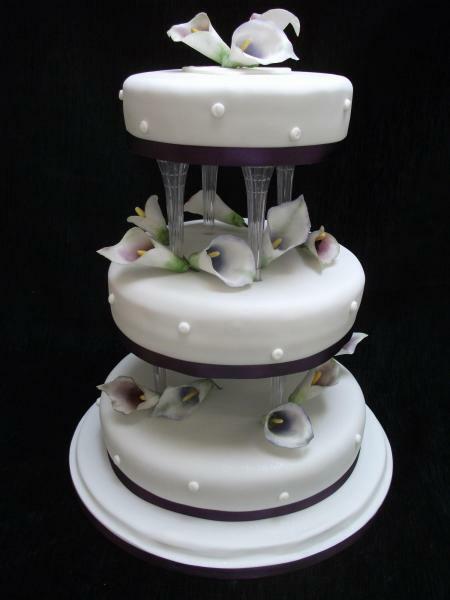 The middle tier is of a varying shape (in this case a teardrop) with hand finished beading for added interest. 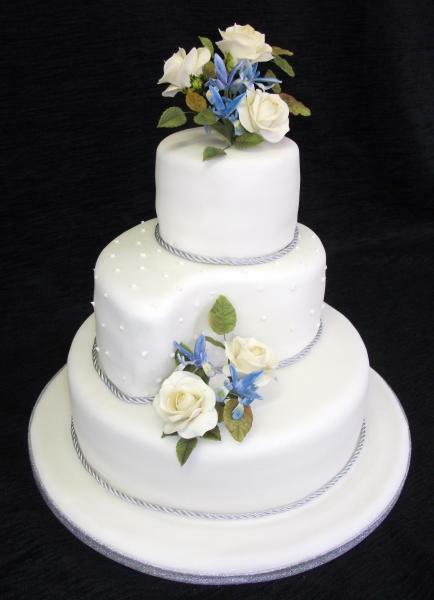 Hand made sugar sprays are tucked in between the tiers in colours to match the bridal bouquet. 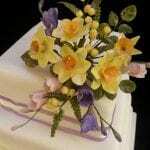 This would obviously work with many different combinations of flowers and colour schemes. 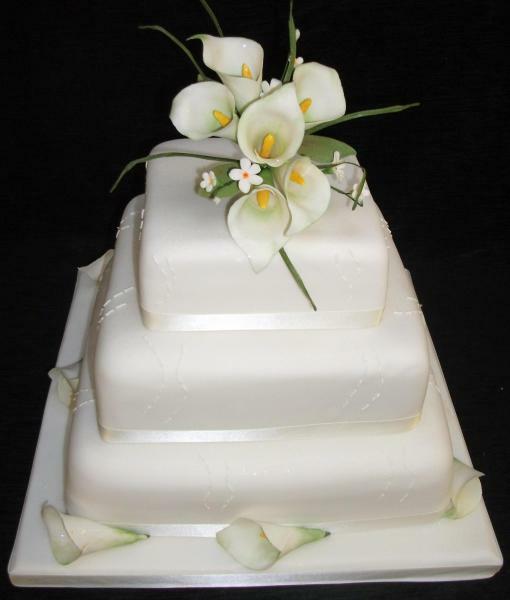 This particular customer wanted a simple floral design but more elaborate arrangements would work just as well. 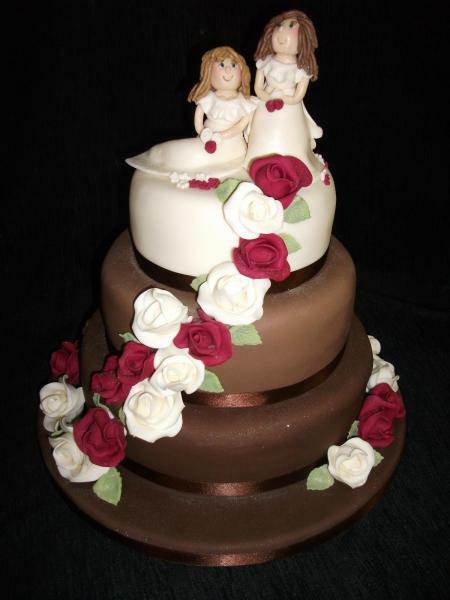 Two of the tiers are stacked, with a gold cherub holding up the third tier for extra height and added impact. 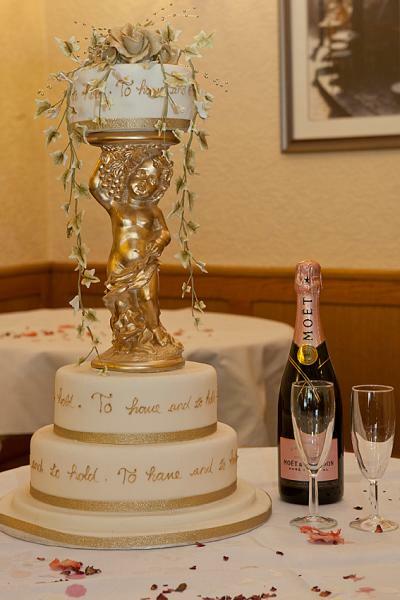 This cakes, in finest fruit or sponge cake, are covered in champagne sugar paste and “to have and to hold” is hand piped in gold all the way round. The golden flower spray and trailing ivy are added to give a decadent feel. 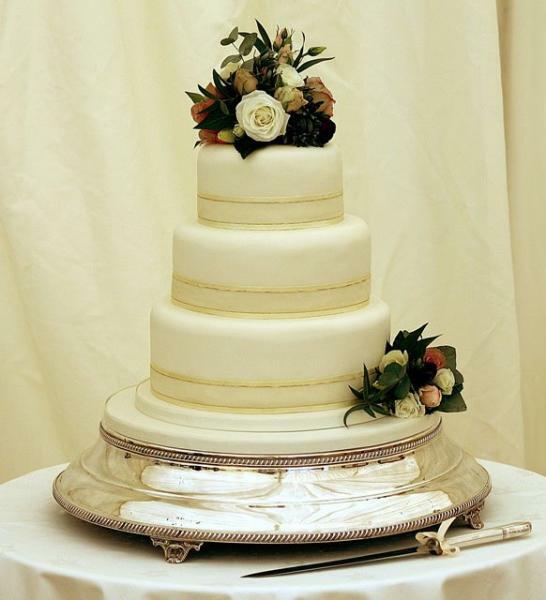 Classic stacked wedding cake design in either finest fruit cake, sponge cake or a combination of the two. 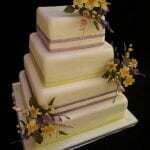 This style works well in three tier and four tier. 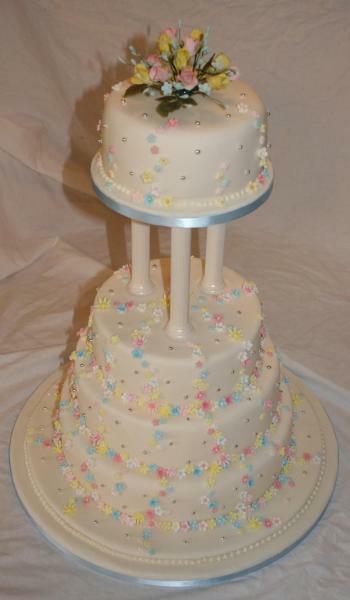 Columns were added to support the fourth tier to give the cake added height and impact. 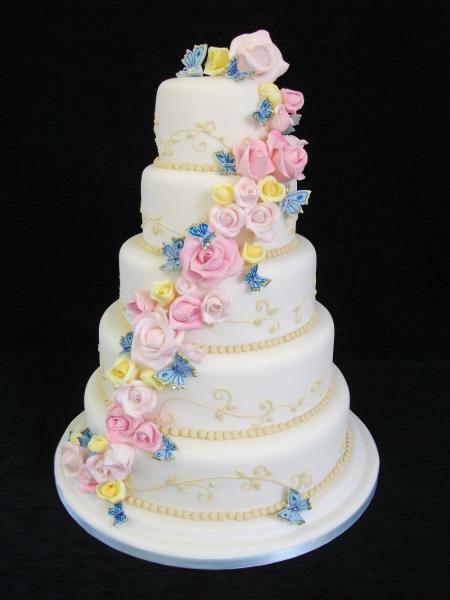 The cakes were covered in white sugar paste before hand cut pastel flowers were individually applied. The examples here are strewn with pastel shades in the style of the classic Chanel Cake, but other colour combinations work just as well. 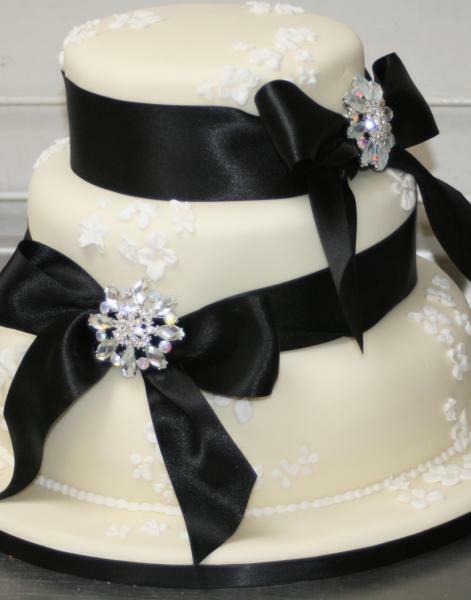 Three tier stacked wedding cake with simple ribbon trim. Fresh flowers were used in this instance to tie in with the overall wedding theme. 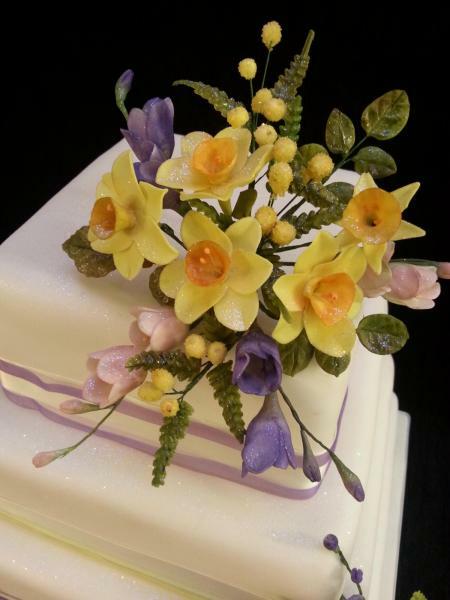 However, hand crafted sugar flowers can also be used, which can then be kept as a keepsake. Hand crafted sugar paste sprays individually priced. 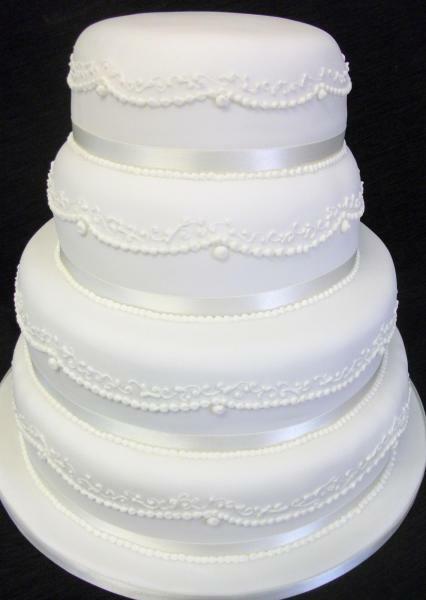 A five tier stacked wedding cake, each tier finished with hand-piping. 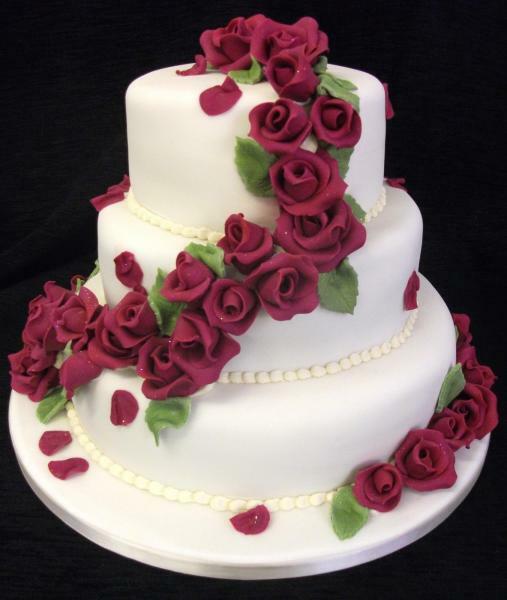 Hand crafted sugar paste flowers are individually applied in a cascade down all five tiers. 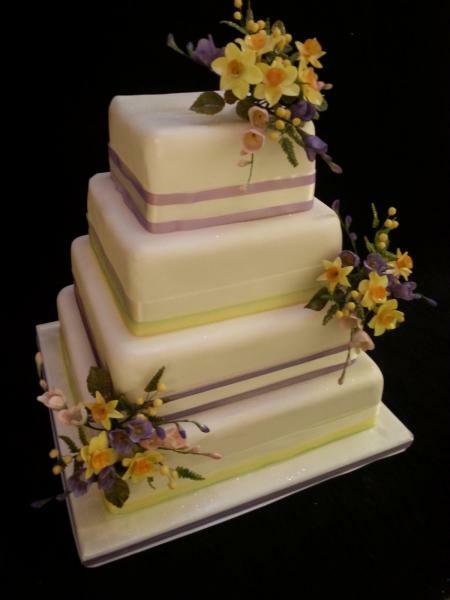 Pastel shades are shown here but these can be adapted to your wedding theme.